Bibles, previous attribute of God posters, a large piece of paper with the words GOD IS THE DELIVERER written on it, key verse (2 Samuel 22:2) printed on a piece of paper, blank paper and markers or colored pencils for each child in the group, a large poster board or piece of paper large enough for all the kids to sit around it. Ask if anyone can remember the 4 truths we’ve learned so far. Have the kids stand up and say the attributes of God and do the motions. After reviewing these few truths about God, pull out a large piece of paper. Tell the kids that at the end of our story for the week, we will read this verse (Exodus 17:15)- – “….the Lord is my banner.” Moses said this as a reminder that God was the one who delivered them from the Amalekites. (We’ll hear more about that soon. Explain that banner can be like a flag that that you wave to show your allegiance or who/ what you follow. Work together as a group to make a banner or flag that you can wave (or hang on the wall) as a reminder of who God is and what He is like. Use some of the truths of God that we’ve been learning so far this year and other things that you know about God or think we may soon be learning about God. 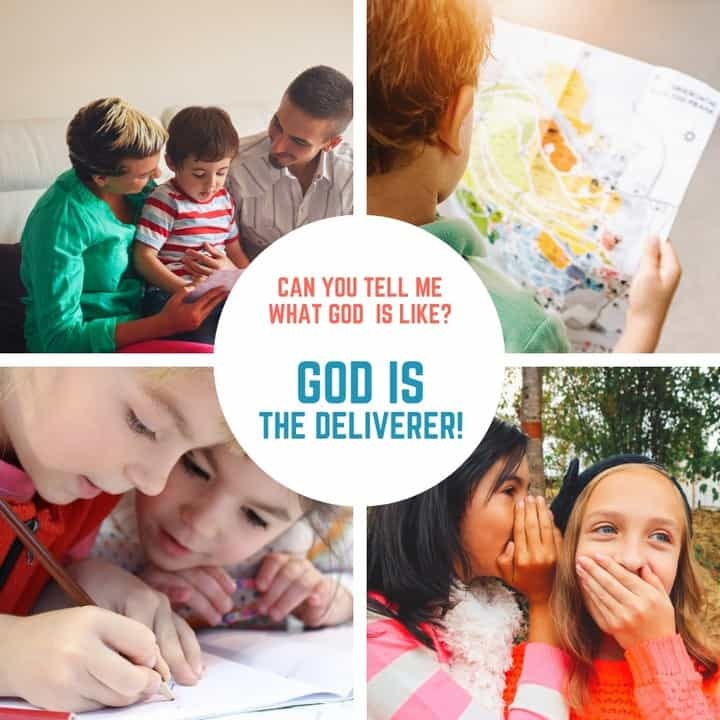 Get started by showing kids the poster that says GOD IS THE DELIVERER and ask if any of the kids in the group know what that word deliverer means, or if anyone has any guesses what it might mean. Ask kids in the group to read the other supporting verses (2 Samuel 22:2, Psalm 18:2, Psalm 40:17, Psalm 140:7, 2 Kings 19:19) to see times in the Bible where God is seen as being the deliverer and after each verse, ask if they have any more of an idea of what it might mean that God is the deliverer. Explain that often the word deliverer is used to describe someone who delivers something to someone….ask, what does the “FedEx” guy do when he delivers a package to your house?….. he makes sure that the package gets safely from his office to your door….he protects the package and takes care of it. Explain that in one sense this is what we are saying is true about God – God delivers His people from sin & death and delivers them to life. Tell the kids that to help make sense of this truth about God that we’re going to look at a story from the Bible and see how God delivers His people in this story and what He delivers them from. After this brief introduction, read Exodus 17:8-16. We are including that portion of scripture here from the ESV, but we recommend you read out of a printed Bible during the lesson. Please use the translation preferred by your church. Then Amalek came and fought with Israel at Rephidim. So Moses said to Joshua, “Choose for us men, and go out and fight with Amalek. Tomorrow I will stand on the top of the hill with the staff of God in my hand.”  So Joshua did as Moses told him, and fought with Amalek, while Moses, Aaron, and Hur went up to the top of the hill. Whenever Moses held up his hand, Israel prevailed, and whenever he lowered his hand, Amalek prevailed. But Moses’ hands grew weary, so they took a stone and put it under him, and he sat on it, while Aaron and Hur held up his hands, one on one side, and the other on the other side. So his hands were steady until the going down of the sun. And Joshua overwhelmed Amalek and his people with the sword. remind the kids where in the storyline of the Bible this takes place… God has led His people out of slavery in Egypt and they are in the desert. This is before God gave the law. How did Moses react when the Amalekites attacked them? What did Moses take with him on top of the hill? What happened when Moses had his hands in the air? when he dropped his hands? How did God deliver His people from the Amalekites? EXPLAIN: Ask….. how did God deliver His people in this story? Remind the kids that even though it was Joshua and his men with swords on the battlefield that it was God who won the war. Since motions & actions help kids remember, choose an action for DELIVERER. A good motion might be to pretend to hand something to your neighbor. Read the memory verse (2 Samuel 22:2) a few times together and make up motions to help you learn the verse. Practice saying the verse with motions a couple of time. In our story this morning, God delivered His people from danger by fighting for them in the battle against the Amalekites. God protected them and took them from a dangerous place where people were fighting against them to safety. Throughout the Bible we see examples of God delivering His people….Daniel from the lions, Jonah from the whale, the Israelites from slavery, etc. In each of these examples we are reminded of the ultimate deliverance that God has brought from His people through Jesus. Before Jesus we are all separated from God. The Bible says that we are living in darkness and as slaves to sin. (Ephesians 4:17-18) But, because of His great love for His children, God sent His Son as the Deliverer. The One who would lay down His own life (John 10:11, 1 John 3:16) to rescue/ save/ deliver His people. Give each child a blank piece of paper provide markers or colored pencils. Encourage them to write the word deliverer somewhere on the paper and then write or draw something to help them remember this attribute of God. You might want to recommend that they draw the story in a cartoon style…what happened when Moses’ hands were in the air and what happened when they dropped down. After a few minutes, bring the group back together and give kids time to share what they have drawn or written.